The harsh winter of 2015 is almost over. But what did it do to your roof? Snow, ice, hail, winds, rain and wide temperature change cycles are damaging to your roof! The roof membranes, gutters, flashings, metal and accessories are all areas of concern and in need of inspections and/or repairs. Even if you do not have a roof leak, a roofing contractor can assess if moisture has damaged the insulation or decking on your roof and potentially comprised the lifespan of your roof system. That’s why you need a roofing contractor who understands weather-related problems and solutions and has the equipment such as thermal scan to access your roof. Snow & Ice - After a harsh winter, wide temperature variations and freeze / thaw cycles can exacerbate roof defects and compromise the integrity of the roof system. Now that winter is over, let us inspect your roof. Stop the damaging effects of winter and prevent roof leaks in the spring by knowing the condition of your roof, undertaking needed repairs and perform preventative maintenance. Being proactive saves money in the long-term! Let us help you with practical, cost-effective rooftop tools to help minimize problems from snow and ice melts. Heat Tape is installed in downspouts and gutters to help control ice build-up at the edge of the roof and to prevent the collapse of the downspouts or gutters. Snow Guards are installed at the edge of the roof to hold onto snow so that snow and ice melt gradually and fall off the roof slowly. The snow guards prevent chunks of snow and ice from sliding off the roof and causing damage to people, vehicles or equipment on the ground. Rooftop Snow Removal - Use a Roofing Contractor! Use a roofing professional to remove snow from your roof. How would a non-roofing snow removal team understand the complexities and hazards on your roof? 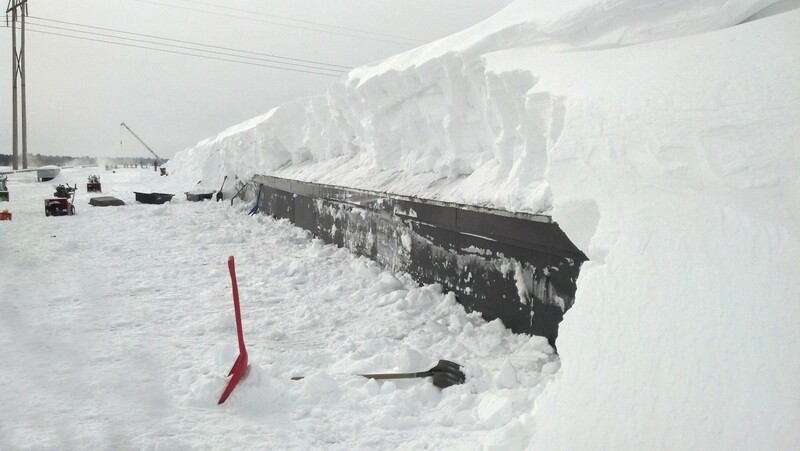 What’s underneath all the snow on your roof? Gas lines, electrical conduits, skylights? CentiMark places markers to identify skylights and other roof projections. A roofing contractor not only removes the snow safely and without damaging the roof, but also knows how to examine the underdeck for fatigue that may indicate excessive weight load that could lead to a roof collapse. Weather causes damage to your roof. CentiMark understands that. Call us for inspections, repairs or emergency leak repairs @ 855-483-1975. We can handle what Mother Nature brings.